Click the newsletter to read about our latest news, events, and more! 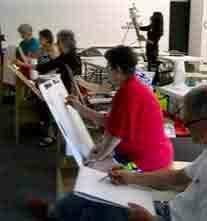 Founded in 1975, the Watercolor Art Society – Houston (WAS-H) is a non-profit organization with over 700 members. For over 40 years, WAS-H has brought the excitement of water-media to the greater Houston area with outstanding exhibitions, world-class instruction and dedicated community outreach. Year-round opportunities are provided to every level of painter, from novice to the seasoned expert. Art lovers are invited to enjoy year-round exhibitions in our gallery in the Museum District. Open Studio is on Fridays from 10:00am - 2:00pm. The WAS-H classroom is open free to members on Fridays when no class is scheduled. Bring your lunch and enjoy the camaraderie! Join our Model Lab for figure drawing and painting sessions each Wednesday from 12:30pm - 3:30pm. Models are clothed and/or unclothed. $10 for members and $14 for non-members, exact change appreciated. Community outreach activities are central to WAS-H's mission. The volunteer opportunities are diverse: members judge and volunteer for exhibitions, performance demonstrations and instruction in schools, homeless service centers, colleges, hospitals and community centers. Long-term programs include the Senior Art Class, the HSPVA scholarship and participation in the Arts in Medicine program at Texas Children's Hospital. As a supporter of WAS-H, you help bring the power of water-media art to the Houston community. Your contribution funds both our organization's daily operation and future. WAS-H is a 501(c)3 nonprofit organization and all donations are tax-deductible. Your contribution supports both daily operations and long term expenses. Plus, you can make the most of your gift through workplace matching gift programs. Some companies will match, double or even triple your gift. Volunteers are the backbone of WAS-H, making possible exhibits, receptions, workshops and the many programs offered at our facility. Check our Sign-Up to learn more about opportunities. 0.5% of the purchase price of eligible products goes to WAS-H. It adds up! Click HERE for instructions to shop with AmazonSmile on your mobile device. ©Watercolor Art Society-Houston. All images on this site are property of their respective owners. All rights reserved.